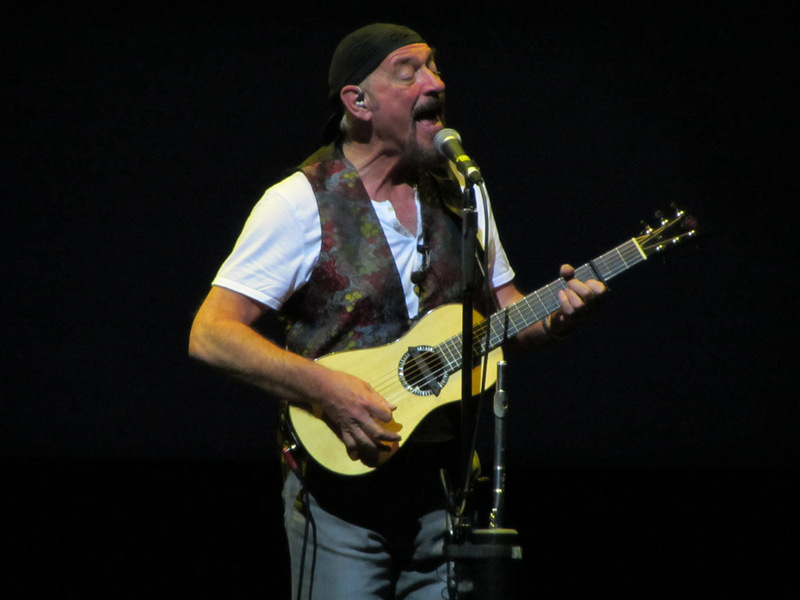 It was 40 years ago, almost to the week, that as a 15 year old boy I queued outside a decaying boxing stadium in Liverpool to witness my first rock concert - Jethro Tull touring their prog rock epic, and follow up to Aqualung, Thick As A Brick. Expectation hung heavy inside the creaking venue that night, as did a heady mist of dry ice, cigarette, and other stimulant smoke. 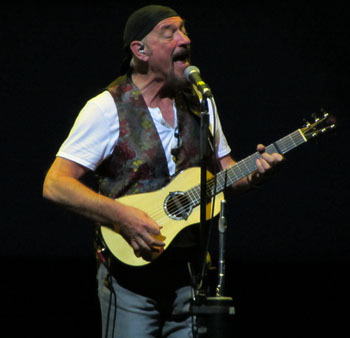 It was a gig that cemented a life long love affair with rock music, and indelibly stamped in my memory an iconic image of Ian Anderson caught in mid air, flute aloft triumphant, in a strobe of orange spotlights and pitch blackness to the staccato closing riffs of 'side one'. Follicly challenged, and with expanded girths, both Anderson and his audience have seen the world change immeasurably, and not always for the better in those intervening years. I suspect many of those present on that night back in 1972 were also in the audience tonight, making a pilgrimage to pay to homage to a defining era of their youth. Follicly challenged, and with expanded girths, both Anderson and his audience have seen the world change immeasurably, and not always for the better in those intervening years. But what none have witnessed, despite numerous reunion, anniversary, and other tours is a full and faithful rendition of Thick As A Brick. It turned out, however, to be a game of two halves. 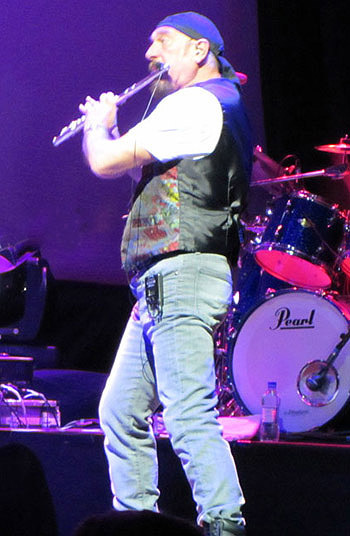 Those who have followed Tull closely down the years will know that it's not just Ian Anderson's aerial dexterity that has diminished with the years. So too has his ability to hit his vocal range of yesteryear, and on TAAB it was cruelly exposed. So much so that Ryan O'Donnell, a young actor/singer from the touring production of Quadrophenia, was drafted in to add vocal and 'theatrical' support. It was quite surreal - aside from O'Donnell taking the majority of the vocals, he was subtly finishing just about every line Anderson attempted. The band (Florian Apahle, Scott Hammond, John O'Hara and David Goodier) too, produced what seemed an oddly sterile rendition, the result being something more akin to a West End stage production. Had it not been for Anderson's presence on stage the spectacle could easily have been mistaken for a not terribly convincing tribute act. TAAB2, which made up the second half of the set, was however, a very different affair. Recorded to suit Anderson's current vocal register he took the bulk of the vocal lines in a way he's not managed for years, the volume was noticeably cranked up, and the band showed a real enthusiasm for the work with O'Donnell being relegated to a far more peripheral role. It was as impressive as 'Tull' have been for many a year. Combined with the lack of encore, I came away with mixed emotions. To my mind it would have been preferable to re-score TAAB to better suit Anderson's current vocal register, or at least employ a vocalist who could ape his style. O'Donnell was more of a 'performer' than a singer and personally I'd rather not have seen TAAB desecrated in that way. 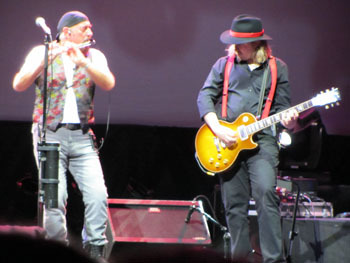 The talk before the gig was of Martin Barre's absence. What everyone wanted to know was 'why?' With hindsight, the answer, it seems, may be self evident. But then maybe my expectations were too great. It was a bit like arranging to meet an old flame in the hope of reigniting the passion of one's youth, only to discover that the years have taken their toll, her looks have faded and her curves subsided. But a bit like TAAB2, her daughter on the other hand, is something of a revelation.